Find hotel near Hunter Beer Co At Potters .. The Hunter Beer Co. is the only microbrewery in the Hunter region. The brewery has 10 of their own beers on tap in the tasting room. 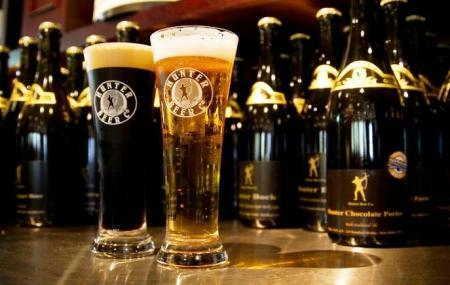 All their beers are made using traditional brewing equipment and natural ingredients. For those who want learn more about the brewing process, tours are conducted by one of their brewers. The tours give you a behind the scenes look along with 3 beers for tasting. The Potters Resort where the brewery is located also has a fine dining restaurant and luxurious accommodations. Tours take approximately 45 minutes and include a tasting. Do try some of their fun flavored beers like chocolate, cherry etc. Brewery Tours from Monday- Friday at 4:00 pm. Saturday & Sundays at 12 noon & 4:00 pm. Bus Stop: Nulkaba Post Office Allandale Rd on Bus No. 167. How popular is Hunter Beer Co At Potters Hotel Brewery Resort? People normally club together Hunter Valley Zoo and Hunter Valley Wineries while planning their visit to Hunter Beer Co At Potters Hotel Brewery Resort. Lovely staff - no exception. We are here at Easter and the place is extremely busy but it's been an absolute pleasure to meet all the staff. Rooms are comfortable and quite well appointed; if there's something you need, they will get it to you in good time. Highly recommend. Also, great food & great beer! The T-bone was good and most staff are quite friendly except one, who seems to be happy checking whether people are doing the right thing and went bluntly to my wife and ten year old daughter to see whether her bouncy toy ball was hers, only because they had similar balls. Are you a police woman? Who gives you the right to suspect that my daughter is taking your property? When I tried to talk to the manager they both tried to show their ‘professionalism’. Very bad customer service for this one staff - and manager is overly protective of own staff too for the sake of it! Standard ‘line the stomach’ pub food and service... The premises looks so great from the road, and I think my expectations were too high based on how historic, rustic and elegant this place looks and proximity to boutique brewery. I expected the food and experience to follow suit... not to be. However would be a good place for a piss up, boozy family function, or stop over on a messy pub crawl. Went here for a few drinks with my friend a few months ago and the service was wonderful. The staff were so lovely and helpful - giving us ideas for the wine tour that day. Food was also amazing! The location is good. There is a good range of beers on tap. Star are friendly and the service is good. The rooms are dated and tired looking.